KiCKASS WiTCH : Putting The "K" In Magick: "What do you need speech class for? You talk fine." "What do you need speech class for? You talk fine." The title of this post is actually a quote from my favorite movie, Working Girl. 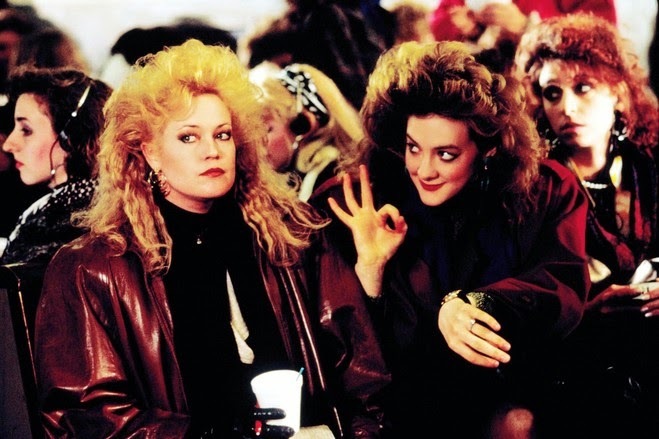 Tess McGill, the movie's kickass protagonist, is someone I completely relate to and am inspired by. Anyway- part of her desire to improve her skills and make it to the top of her chosen profession involved taking speech classes & "What do you need speech class for? You talk fine." was the possibly misguided advice given to her by her well-meaning best friend. And... you can SiGN UP for the Spring Equinox module of The Psycho-Spiritual Wheel Of The Year HERE. It's me, Tess/Purrbugaloo!! I love your quote! I'm still around. You Tube hasn't been letting me comment on videos and facebook has been crashing my computer -- all that to say, I haven't forgotten about you. I'm cheering for you. You are fabulous, articulate, and deserving. Can't wait to hear about your big opportunity. There is nothing like having a great experience in front of a huge live audience. It is so great to interact with that many people, seated forward, eager to hear what you're going to say next! Do it. Do it Do it! Wishes for blessings and spice and everything nice on your new endeavors!! !